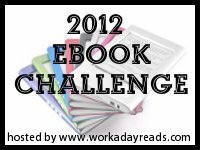 Close Encounters with the Night Kind: 2012 E-book Challenge!! So I was reading through my subscriptions when I came upon Roof-Beam Readers mention of an E-book Challenge. I thought hmm...as I am glancing through the books on my adobe reader, this maybe what I need to get through these pateintly waiting great reads!! So..I'm in!!! Since we can always move up but never down, I 'll start as a memory stick!! Here are the rest of the juicy details!! To sign up please visit Workaday Reads. Not me but the lovely lady that runs Workaday Reads :) Come on over!! It sounds great! !